For people with cardiovascular problems, such as angina, even simple activities—like going to the mailbox or walking the dog—can be challenging even after bypass surgery. If you are one of these people, take heart. There is a non-invasive treatment called RejuvaHeart™. This therapy has clinical experience that has proven to be safe and beneficial for the treatment of angina and heart failure. The RejuvaHeart™ system provides significant improvement to the entire health system by restoring the delivery of oxygenated blood to all parts of the body. Approximately 80% of patients who complete the 35-hour course of RejuvaHeart™ therapy experience significant symptom relief and a more efficient vascular system that may last up to three years. Treat and improve quality of life for patients who don’t respond well to medications or are not candidates for surgery. Treatment is non-invasive and requires no medication. Improves cardiovascular circulation and minimizes dependence on medications. The hour long treatment is painless and patients can read, watch TV, sleep or talk to someone for the hour. Clinical studies show RejuvaHeart™ therapy is effective in more than 80% of patients. Relief from chest pain, shortness of breath and other symptoms occur three to four weeks after beginning the treatment. Beneficial for patients experiencing erectile dysfunction. For people with angina or heart failure, even simple activities—such as going to the mailbox or walking the dog—can be challenging. If you are one of these people, take heart. 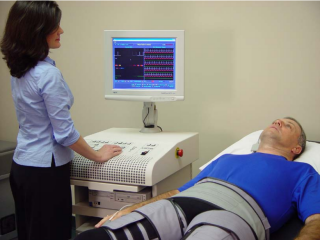 There is a non-invasive treatment called RejuvaHeart™ External Counter Pulsation. This therapy has clinical experience that has shown to be safe and beneficial for the treatment of angina and heart failure. Approximately 80% of patients who complete the 35-hour course of RejuvaHeart™ therapy experience significant symptom relief that may last up to three years. RejuvaHeart™ therapy is an outpatient treatment that is usually given for an hour once or twice a day, five days a week, for a total of 35 hours. 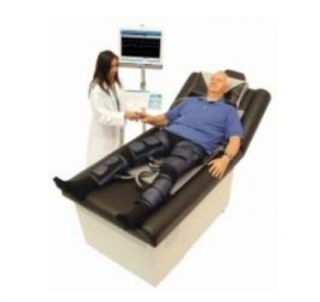 During the treatment, you lie on a comfortable treatment table with large blood pressure-like cuffs wrapped around your legs and buttocks. These cuffs inflate and deflate at specific times between your heartbeats. A continuous electro cardiogram (ECG) is used to set the timing so the cuffs inflate while the heart is at rest, when it normally gets its supply of blood and oxygen. The cuffs deflate at the end of that rest period, just before the next heartbeat. The special sensor applied to your finger checks the oxygen level in your blood and monitors the pressure waves created by the cuff inflations and deflations. Basically, the RejuvaHeart™ Therapy External Counter Pulsation system pumps when your heart is resting and releases when your heart is working. Well, it means that your heart is getting increased oxygen and blood flow without having to work as hard. External Counter Pulsation (ECP) can decrease the need for medication and reduce or eliminate the frequency and intensity of chest pain. It can also improve your ability to participate in activities of daily living. External Counter Pulsation (ECP) is also believed to create new pathways around blocked arteries in the heart by expanding or growing what are called collaterals, additional networks of tiny blood vessels that supply the heart muscle. After completing treatment, many patients are able to enjoy moderate levels of exercise for the first time since the onset of their angina symptoms.